I don’t live in the city anymore, but when I did, I never once gave money to sign-holders. I’ve never dropped even so much as a quarter in a Salvation Army bucket. That’s a shame. No, it’s more than that. It’s a complete disgrace. But then I saw the dejection in his eyes, and the humiliation, and the hopelessness. I knew, even before I had heard five minutes of his story. This man really is homeless. But that’s not the reason for the pain in his eyes. His heart is shattered because he is alone, scorned and rejected. Depression is a taskmaster who steers the wheels of many, many….. FAR too many lives. No one sees these lives, because they are too ugly—too unpredictable to look at. Yet denying their existence does not cause them or their problems to disappear, and so they exist, and careen farther and farther into the ever more arid desert of un-lovedness. Richard is one, and it didn’t happen by choice. He didn’t start out homeless. It wasn’t the choice of the 30 men and woman eating ham around me at the Catholic nunnary, the people who had nowhere to go on Christmas morning. It wasn’t their choice that EVERY single one of their friends disowned them. It wasn’t their choice that their business went bankrupt and the bank took all they owned. 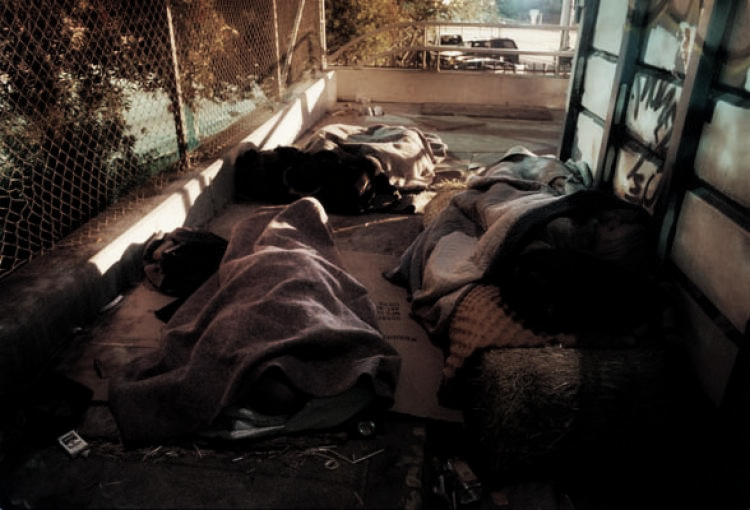 It wasn’t their choice to be a victim of abuse, and to live life on the move from city to city, hiding for their life. And the ugliest part of their reality is that almost nobody takes the time to understand them–and that fact alone is the most undeniable proof that they are unwanted and unloved. Richard and his friend C–two real people with beating hearts just like yours and mine–sat down together one day, having just seen their homeless friend Adrian being dragged behind a car in retaliation for a drug deal gone bad. This is what they said. “Yes, and people are afraid of the homeless today. And they are disgusted when they see a person digging through a garbage can or a dumpster. They’re frightened when someone unclean talks to them—afraid they might ask for money, afraid they will steal their car or rob their house or stab them. But it isn’t the homeless they should fear. “Can you imagine that one Christmas Eve, Ridgeway got off work early, cashed his Christmas bonus check, went to the mall, bought some presents on his MasterCard, had dinner at home with the wife, and then went out and killed a young woman and dumped her body along the road? She was one of those disgusting, homeless prostitutes people fear. H—, maybe the %$@# did her a favor! She would probably have had to sell her body over and over again for ten, maybe fifteen years just to pay for a three-hundred-dollar-a-month apartment, electric and water, and a run-down car! People should REALLY be afraid of guys like the Tacoma police chief who shot his wife to death in the parking lot at the mall. Or the son of the director of the Department of Corrections for Washington state who raped a two-year-old. He pleaded guilty and got a whole six months! If a homeless guy had done that, he’d get life in prison! You know, the big thing that sets the homeless apart is that they usually only commit crimes out of desperation. Those with homes and jobs commit crimes out of boredom or hatred or greed. ‘You are not needed anywhere, not wanted anywhere. Nobody cares what you do.’ And you know, unless people have been there—lost, alone, rejected, feeling worthless and unwanted— they just can’t know the numb feeling that drags you down. All the dreams are gone, gone forever. You’re just hoping for some force to end the nightmare peacefully. Homelessness in this great country of the United States is an abomination! If you tell the same lie over and over again about the homeless, eventually it becomes the truth. You tell your wife the lie, then you tell your children the lie. Rush Limbaugh and Mike Savage then broadcast the lie, and politicians who want your vote politicize the lie. The lie just grows and grows. Homelessness in America is an abomination! But even worse? My response.